The Sugarloaf Heritage Council (SHC) has donated a trailer to Arkansas State University-Beebe Heber Springs campus. The SHC purchased and donated the off-road dumping trailer for the purpose of maintaining Sugarloaf Mountain’s trails, as well as other recreational or maintenance related tasks on campus. ASU-Beebe Development Officer, Andrea Cole, said, "Sugarloaf Mountain is something special and unique in the fact that it belongs to ASU-Beebe. We take a lot of pride in the preservation of the natural beauty that surrounds the Heber Springs campus and the many visitors that visit the mountain each year." The trailer is an ABI Workman trailer made by the Bosski Corporation. The trailer features include: a 1,600 pound capacity, electric dump and electric brakes, as well as off-road tires and wheels. The driver-controlled electric dump feature makes it ideal for spreading trail gravel. 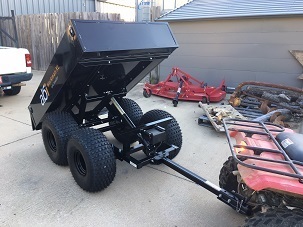 The large off-road wheels allow maintenance personnel to easily haul gravel and maintenance supplies to rough trail areas not accessible by a tractor. The SHC has purchased numerous other items for use in the removal of graffiti, brush mitigation and general trail maintenance. This equipment is used for other campus work when needed, but is primarily used for trail maintenance. Likewise, the donated trailer is also used on campus to spread mulch and carry landscaping equipment. Since ASUB Heber Springs is located at the base of Sugarloaf Mountain, Maintenance Coordinator Jeffrey Baggett is responsible for ensuring the trails are maintained and kept safe for the public. Before SHC donated the specialized trailer, maintenance work was accomplished with a much smaller garden cart, which would often break down due to the rough terrain. Baggett said the garden cart could not sustain heavy loads of gravel, and made spreading trail gravel incredibly difficult, as everything had to be done by hand, taking a longer time than expected. The new SHC donated trailer makes this process easier, faster and more efficient. According to Baggett, the trailer will also be used to repair flooding damage to the trails from the late summer and early fall of this year. In the fall of 2007, the Sugarloaf Heritage Council was formed in response to concerns over the deterioration of the Sugarloaf trails and the large amount of graffiti on the mountain. It became a non-profit organization in 2008, with six charter members including Baggett. The SHC began raising money for the preservation of Sugarloaf Mountain recreational areas, and soon had enough funds to remove all of the graffiti and apply for a grant from the Arkansas Department of Transportation's Recreational Trails Program. The Summit Trail was restored and plans were developed for three more trails on the property. The last trail, the Wildlife Nature Trail, was opened in 2018. The SHC continues to sustain a maintenance fund to be used for the preservation and improvement of the trails. ASUB Heber Springs maintenance personnel perform routine care and address safety concerns on the trails, the SHC has volunteers that come in regularly to help clear away trash, repair trails and improve the overall Sugarloaf experience. Arkansas State University-Beebe’s Heber Springs campus offers associate degrees, vocational and technical classes for both traditional high school students and non-traditional students. The almost 255-acre campus is located at the base of Sugarloaf Mountain in the heart of the natural beauty that surrounds Greers Ferry Lake. Students and instructors use the various trails for biology, science, and other classes. For more information about the history and conservation of Sugarloaf Mountain, visit www.sugarloafheritagecouncil.org. For information on ASU-Beebe programs offered, call (501) 882-8860, or view the ASU-Beebe website at www.asub.edu.